By CNN'S GENEVA SANDS, THERESA WALDROP, ADOLFO IBARRA AND ANNE LAGAMAYO CONTRIBUTED TO THIS REPORT. (CNN) - Maria Valles de Bonilla asked her granddaughter to buy her a new blue dress. She wanted to wear something special for the occasion when a dream she'd had for so many years would come true. While voters were lining up at polls across the country to cast ballots in midterm elections, Valles, 106, lined up at a US Citizenship and Immigration Services office near the nation's capital so that someday she might have a chance to vote, too. Three generations of her family -- children, grandchildren and great-grandchildren -- drove through pouring rain that drenched northern Virginia on Tuesday to get her there on time. One daughter flew in from California. Her family had feared Valles wouldn't make it after suffering two heart attacks in April. "When I'm asked about the most important event in my life," Albright said, "my answer is becoming an American." Becoming a US citizen had been a dream of Valles' for years. Originally from El Salvador, she became a permanent resident of the United States about six years ago, after one of her sons sponsored her. Six of Valles' children live in the United States. Most of them are citizens, too. When she met with a USCIS officer for her citizenship interview, family was on Valles' mind. "She told the officer that it was her husband's dream to become a US citizen," said Jim McKinney, a spokesman for the agency. "But unfortunately, he passed away before he could do so, so she is becoming a citizen for both of them." An image of the Statue of Liberty with the famous words of poet Emma Lazarus flashed across the screen: "Give me your tired, your hungry, your poor, your huddled masses yearning to breathe free." "This country is now your country. ... We share one American heart and one American destiny," he said. "You now share the obligation to teach our values to others," he continued, "to help newcomers assimilate to our way of life." Long after that video was recorded, in his closing argument before Tuesday's election, Trump zeroed in on a hardline anti-immigration message to fire up his core supporters. Tuesday's ceremony, just miles from the White House, came after days of fierce criticism from Trump about migrants from El Salvador and other Central American countries who are traveling in large groups to seek asylum in the United States. But Valles and her family weren't dwelling on any messages from Trump. "The President says what he thinks is the truth. I always say that American people who God gave the opportunity to be born in this country shouldn't think less of anyone just because of where they were born," said Bernarda Bonilla, one of Valles' daughters. "Every person thinks what he wants, and I respect that. Only God knows the correct response." 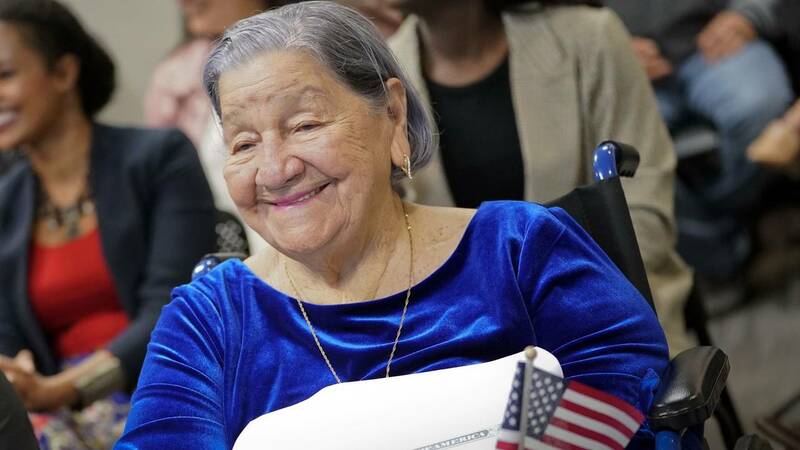 Valles isn't the oldest person to become a naturalized US citizen. That record belongs to a Turkish immigrant who was 117 when she took the oath in Los Angeles in 1997. But McKinney said Valles is the oldest person anyone in the agency's Washington district office can remember naturalizing. "Even if you're not that young, you can do it," Valles said after Tuesday's ceremony. "I did it at this age." "Buena suerte," Immigration Services Officer Felix Zamot told Valles afterward. Good luck. "She prays for you every day," Valles' granddaughter said. Valles -- who was born eight years before women got the right to vote in the United States, and 38 years before unconditional voting rights were granted to women in her native El Salvador -- has never cast a ballot. But she's always been fascinated by watching her children and grandchildren vote in the United States. Even though she's a US citizen now, Valles wasn't eligible to vote on Tuesday. Virginia's voter registration deadline was in mid-October. But her family says that doesn't dampen their enthusiasm, and that having the ceremony on Election Day was particularly meaningful. "God's timing is perfect. It was a perfect day. It is a day of change," Bonilla said, "and a day of changing her life." Bonilla said Valles' entire family is grateful for every day they spend with her. And hoping that in the future, they'll be able to take her to vote. "I would like to one day," Valles said, "if I can."